Propter Dolby, “Comet at Four Years,” 1868. Oil on canvas, 23 x 35 inches. McGill Visual Arts Collection 1973-244. On view at Macdonald Campus. With over 2,500 artworks dispersed across nearly 90 buildings over three campuses, McGill’s Visual Arts Collection is not easy to take in as a whole. As a Museum Database Assistant responsible for inputting information on hundreds of objects into a new Collections Management System, I’ve discovered unique works that I would have otherwise never seen. Artworks on display at Macdonald Campus are especially unknown to McGill community members on the downtown campus. Unlike anything I’ve seen before, the oil paintings of cows pictured here were done by various livestock artists in mid-19th century Britain. Showing prize-winning shorthorns, the portraits are not exactly lifelike. 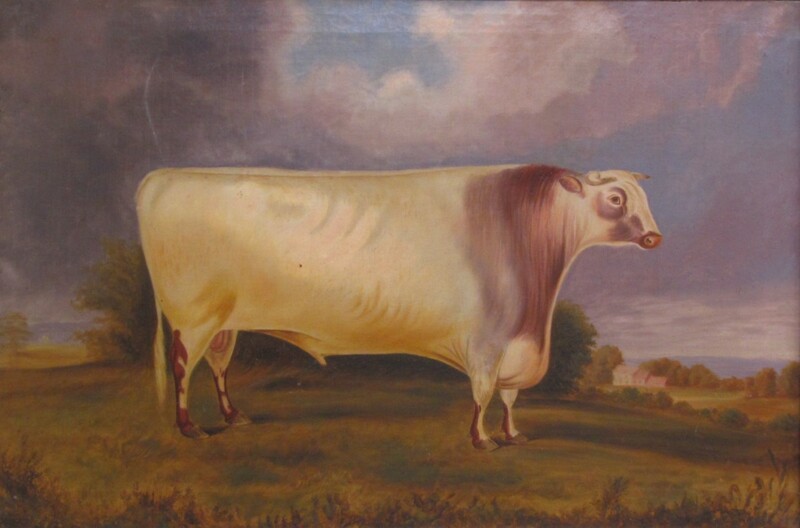 In fact, they look as if painted by someone who had never seen a real cow. Wonky proportions (are those not the tiniest legs you’ve ever seen on cattle?) and odd colours (purple cowhide is news to me) abound. Some may think the paintings too odd to have any aesthetic value, but they certainly have historical value. In 19th century Britain, having an artist paint a portrait of your cow (or other prize-winning animal) functioned as a status symbol. Portraits of not-so-lifelike pigs from this period are also plentiful. In all cases, the artist’s exaggerated rendering of the animal’s body was likely intended to emphasize an idealized shape, which usually meant adding more fat and muscle in key areas. 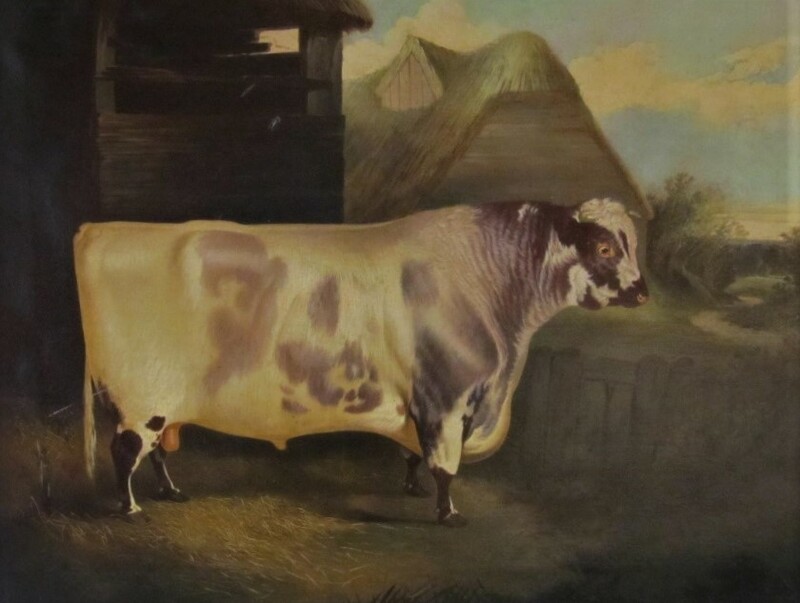 The 19th century equivalent of overly photoshopped images, these livestock portraits also have comedic value. Unsurprisingly, in 2016, a painting of pigs by an unknown artist from this same period became a meme that poked fun at the animals’ diet. As for these beloved bovines, we welcome you to make them into your own farm-friendly memes! 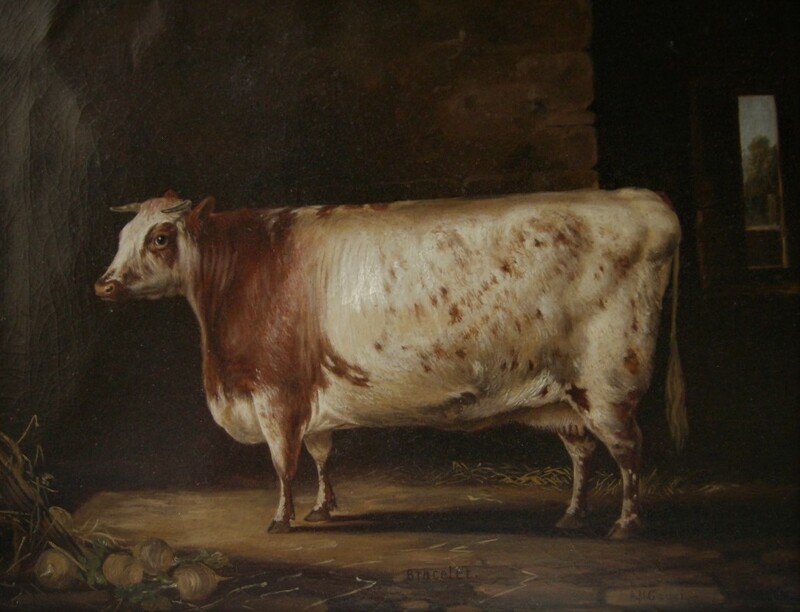 Unknown artist, “Baron Booth of Lancaster’s Campion Shorthorn,” 19th century, oil on canvas, 24 x 33 inches. McGill Visual Arts Collection 1973-242. On view at Macdonald Campus. A.M. Gauci, “Bracelet,” ca. 1840s, oil on canvas, 20 x 26 inches. McGill Visual Arts Collection 1973-246. On view at Macdonald Campus. ‹ It’s International Archives Day !! – C’est la Journée internationale des archives ! !